This article is about Ike's appearance in Super Smash Bros. Ultimate. For the character in other contexts, see Ike. Ike (アイク, Ike) is a playable character in Super Smash Bros. Ultimate. He was officially confirmed on June 12th, 2018. Ike is classified as fighter #32. Ike has new voice clips in both versions of Ultimate, with Michihiko Hagi reprising his role in the Japanese version, and Greg Chun voicing Ike in English, reprising his role from Fire Emblem Heroes and replacing Jason Adkins who voiced him in Brawl and SSB4. Play VS. matches, with Ike being the 14th character to be unlocked. Clear Classic Mode with Mario or any character in his unlock tree, being the fourth character unlocked after Little Mac. Have Ike join the player's party in World of Light. With the exception of the third method, Ike must then be defeated on Coliseum. Ike has been significantly buffed in the transition from Smash 4 to Ultimate. Ike's mobility has been improved to help with the new faster pace of Ultimate, and he shares the universal buffs of a 3 frame jumpsquat (reduced from 7 frames) and significant landing lag decreases for his aerials. Ike has also received a new up air which is much faster and improves his juggling game, while Eruption can now generate a maximum of three flame pillars if fully charged, improving its already powerful ledge trapping potential. Finally, Ike is able to combo with his down throw at low percents more reliably. However, Ike still struggles in some areas. Ike's recovery remains very exploitable due to Aether's short horizontal recovery distance, and Quick Draw not getting changes to help its recovery potential, which was made worse to the reduction in the size of most stage's ledges. The changes to rage have nerfed Ike as well, due to it being much less effective for comebacks when he has a high percentage. Thanks to these changes and improvements to his moveset, many players consider this to be Ike's best iteration in the series, with him getting great results in the early metagame thanks to players such as MkLeo, Marss and Ryuga. 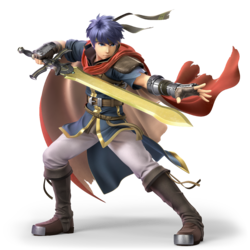 As with all veterans returning from SSB4, Ike's model features a more subdued color scheme. His clothing now features simple detailing, similar to Brawl. Ike's appearance as a Ranger in Fire Emblem: Path of Radiance - the basis of his appearance in Brawl - is his default costume. His appearance as a Hero in Fire Emblem: Radiant Dawn, which was his default design in SSB4, is now an alternate costume, and his previous costumes have been distributed among the two appearances save for the Chrom-based costume from SSB4. The model for his Radiant Dawn appearance is largely similar to SSB4, though his muscles seem more pronounced. Ike's voice changes depending on the costume. In the Japanese version, Ike's voice is deeper and more masculine in his Radiant Dawn costume. The differences are much less noticeable in the English version; Ike sounds slightly more aggressive and serious in his Radiant Dawn costume. Ike has a new idle animation, which is more similar to his idle stance in Path of Radiance. Ike's clapping animation now differs slightly depending on which outfit he is using. Additionally, his sword is no longer present in the "No Contest" screen. Ike has different victory quotes depending on which outfit is used. Like all characters, Ike's jumpsquat animation now takes 3 frames to complete (down from 7). Ike runs slightly faster (1.5 → 1.507). Ike's initial dash is significantly faster (1.5 → 1.815). Ike walks slightly faster (0.869 → 0.912). Ike's air speed is slightly higher (1.08 → 1.134). Ike's traction is much higher (0.044 → 0.112). Forward roll has less ending lag (FAF 33 → 31). Forward roll grants less intangibility (frames 4-18 → 4-15). Back roll has more startup with less intangibility (frames 4-18 → 5-16), and more ending lag (FAF 33 → 36). Air dodge has more startup (frame 3 → 4) and significantly more ending lag (FAF 34 → 50). Air dodge grants more intangibility (frames 3-28 → 4-31). The first hit transitions into the second hit faster (frame 11 → 9), which transitions into the third hit faster (frame 12 → 9), allowing them to connect better. The first and second hits have altered angles and knockback to keep opponents close to Ike, akin to other neutral attacks, allowing them to connect better and jab lock. The first and second hits deal less damage (3% → 2.5%). The third hit has more ending lag (FAF 39 → 41). Forward tilt has faster startup (frame 13 → 12). However, as its interruptibility frames remain unchanged, this gives it one frame more ending lag. It deals more damage (12.5% → 13.5%) without compensation on knockback, improving its KO potential. Up tilt has drastically less ending lag (FAF 48 → 40), which combined with Ike's faster jumpsquat grants the late hit combo ability. The clean hit lasts longer compared to the late hit (frames 11-13/14-21 (clean/late) → 11-16/17-21). Up tilt deals less damage (14% → 12% (clean), 10% → 8% (late)) without compensation on knockback. This hinders the clean hit's KO potential, but improves the late hit's combo potential. Down tilt has increased combo potential due to Ike's faster jumpsquat. Dash attack has less ending lag (FAF 52 → 48). Forward smash's sweetspot deals slightly more knockback (40 base/86 scaling → 49/85), improving its KO potential. Down smash deals more damage (14% → 16% (hit 1), 17% → 19% (hit 2, clean), 8% → 9% (hit 2, late)) without compensation on knockback, improving its KO potential. All aerials have less landing lag (14 frames → 8 (neutral), 18 frames → 14 (forward), 19 frames → 11 (back), 15 frames → 9 (up), 23 frames → 14 (down)). Neutral aerial has faster startup (frame 12 → 10). It deals less damage (10% → 7.5% (clean), 7% → 6% (late)) without compensation on knockback. This hinders its KO potential, but significantly improves its combo potential combined with its lower landing lag. The swing has been slightly sped up, reducing the duration of its hitboxes (frames 12-27 → 10-22), but allowing it to hit around Ike faster. The clean hit lasts shorter compared to the late hit (frames 12-21/22-27 (clean/late) → 10-14/15-22). It auto-cancels earlier (frame 64 → 50). It's initial auto-cancel window has been shortened (frames 1-5 → 1-2). It has a different animation, with Ike facing more towards the screen and no longer tucking his legs in. His entire body now moves with the sword. Forward aerial has faster startup (frame 12 → 11). It now always launches opponents in the direction Ike is facing, even if hit from behind, improving its reliability for edgeguarding. It now sends opponents at a lower angle (361° → 30°), further improving its edgeguarding use. It has increased ending lag (FAF 55 → 60). It deals less damage (13% → 11.5%), and has increased base knockback (30 → 55), but noticeably reduced knockback scaling (100 → 65), no longer KOing middleweights until around 175% from the center of Final Destination. This drastically hinders its KO potential. It autocancels later (frame 36 → 42), thus no longer doing so in a short hop. It no longer has an initial auto-cancel window. Back aerial has significantly reduced vertical range. Ike has a new up aerial: a wide overhead swing starting from the front, similar to the rest of the Fire Emblem cast, but going inwards rather than outwards. New up aerial has significantly increased range and coverage around Ike, especially horizontally, allowing it to juggle opponents much more effectively. It has a shorter hitbox duration (frames 13-29 → 13-18). One of its previous sourspot hitboxes is now a sweetspot, making it easier to meteor smash with. All grabs have more ending lag (FAF 33 → 37 (standing), 41 → 45 (dash), 39 → 40 (pivot)). Pummel deals more hitlag (5 frames → 15), but has less startup (frame 5 → 2) and significantly less ending lag (FAF 23 → 7), shortening its duration. It deals much less damage (3% → 1.6%). Forward throw deals more damage (3% → 3.5% (hit 1), 7% → 7.5% (total)). Up throw deals more damage (3% → 3.5% (hit 1), 7% → 7.5% (total)). The move has more ending lag (15 frames → 23). While his jumpsquat fails to compensate the ending lag, it hinders its combo potential. Down throw has increased combo potential due to Ike's faster jumpsquat. Eruption now produces multiple flaming pillars as it charges, with a maximum of three pillars of decreasing sizes. This greatly improves its range and edgeguarding potential. Fully-charged or high charge levels of Eruption cause Special Zoom when it hits. Quick Draw has less ending lag both when missed (FAF 57 → 53) and when the attack is triggered (FAF 45 → 35). Its charge can no longer be held indefinitely. Aether has less startup (frame 18 → 15), with faster super armor on the aerial version as well (frame 18 → 15). The grounded version grants much more super armor (frames 18-38 → 5-35), allowing it to tank through opposing attacks more effectively. The move has less landing lag (38 frames → 36). The landing hit deals significantly more knockback, now being able to KO middleweights at around 180%. Ike's sword can no longer clip through the bottom of stages while using Aether, instead move along the stages' perimeters, making it less safe against opponents at the ledge. Counter's intangibility is faster (frame 9 → 8). In addition to its full intangibility, it grants intangibility on Ike's head for the entire counter duration. It has a shorter counter duration (frames 8-35 → 8-33). It has more ending lag on both the counter (FAF 59 → 74) and the attack (FAF 35 → 44), making it much riskier to use. It now gives off flaming visuals from Ragnell after Ike performs a successful counterattack. Ike's vocalizations during a successful counterattack have been altered. Path of Radiance Ike says, "Gotcha!" and Radiant Dawn Ike says, "Amateur!" Great Aether is significantly flashier, with a dark blue backdrop alongside flaming visuals. Before the final hit, the victim flashes with blue light, and the landing eruption now appears significantly more cartoony, with fewer smoke effects. Aether's meteor hitbox deals less knockback, but it can still KO opponents first. 2.5% A jab, followed by a front kick, followed by a kneeling downward slash. The first hit can be repeated by holding the attack button. Due to it hitting on frame 4, it has the lowest amount of startup lag out of Ike's entire moveset. When coupled with its respectable damage output, moderate knockback and its last hit's impressive range, it is very useful as a close range option. 13.5% A lunging outward slash. Can be angled. Its startup and ending lag are high for a tilt attack, but it has long range and deals high damage and knockback, KOing middleweights under 130% from the center of Final Destination. 12% (clean), 8% (late) Hops to thrust Ragnell upward while holding it parallel to the ground. It is overall slow for a tilt, but deals respectable damage and knockback, and its hitboxes have a long duration, which alongside its high disjointed range allows it to beat out opposing attacks from above very effectively. The clean hit can KO middleweights at around 130%, while the late hit can set up combos into a neutral, forward or up aerial at low to mid percents. 8% A kneeling inward slash. Due to it hitting on frame 7, it is Ike's fastest tilt attack. It has long range, relatively low ending lag, and launches opponents vertically with high base knockback and low knockback scaling. Altogether, these traits make it a useful combo starter into any of Ike's aerial attacks except down aerial at low to mid percents. However, it deals the least damage out of Ike's tilts, and its knockback renders it unable to KO at reasonable percents. 14% (clean, body), 11% (clean, blade), 9% (late) A lunging, two-handed upward slash. It is one of the most powerful dash attacks in the game, with its clean hit's sweetspot KOing middleweights at around 140% from the center of Final Destination. When coupled with its impressive range and its clean hitboxes' anti-rebounding priority, it is extremely useful for punishing opponents at a distance away, most notably when they are about to land. However, due to hitting on frame 15, it is one of the slowest dash attacks in the game. 19% (early, clean tip), 22% (clean blade) A lunging, two-handed downward slash. It deals impressive damage and knockback, making it one of the strongest forward smashes in the game, and hits in a wide arc that can even reach opponents above and slightly behind Ike, albeit with the early hit. Its clean hit's sweetspot can KO opponents at around 75% from the center of Final Destination. However, its startup and ending lag are extremely high, making it very difficult to hit, in addition to being highly punishable on shield. As a result, the move is unreliable to use except for hard punishes. 17% (clean), 10% (late) An overhead arcing slash starting from the front. It possesses a clean hit during the arc itself, and a late hit as a shockwave when Ragnell hits the ground. Like forward smash, the clean hit boasts impressive damage and knockback; however, its slow startup and high ending lag leave it very punishable. Compared to forward smash, it is noticeably weaker, with the clean hit KOing opponents at around 90%, but has less startup and ending lag, and covers a wider arc around Ike, giving it better utility in punishing landings and rolls if timed properly. Cast Off 16% (hit 1), 19% (hit 2, clean), 9% (hit 2, late) A kneeling, two-handed outward slash in front of himself and then behind himself. It is Ike's fastest smash attack by a considerable margin, hitting on frame 13. The front hit is considerably weaker than Ike's other smash attacks, but still boasts respectable power, KOing opponents at around 105% from the center of Final Destination. As a result, it is Ike's most reliable smash attack overall; however, its high ending lag still leaves it very punishable if missed or shielded. On the other hand, the back hit is slower, coming out on frame 32, and has a much weaker late hit, but its hitboxes have a longer duration, and the clean hit is far stronger, dealing impressive damage and KOing opponents at around 85%, while having less ending lag compared to the front hit. 7.5% (clean), 6% (late) A semi-circular slash in front of himself. It has the lowest landing lag out of Ike's aerials, and its hitboxes have a long duration, provide wide coverage around Ike, and launch opponents vertically. Altogether, these traits make it an infamously reliable combo starter when SHFF'd, while also being a relatively safe spacing option. It is infamous for reliably comboing into a wide variety of attacks, including neutral attack, tilts and grab at low percents, and any aerial attack (including itself) at low to mid percents. At higher percent, it can be followed up with any of Ike's aerials and eventually becomes a notoriously reliable kill set-up into up aerial near 100%, though at even higher percents this stops being the case. It deals the lowest damage out of Ike's aerials, with knockback that prevents it from KOing at realistic percents, and its long duration makes it punishable if used high up in the air, as well as risky to use offstage. 11.5% A two-handed downward slash. It covers the entirety of Ike's foreside, making it capable of hitting above and below himself. Combined with its moderate startup, landing lag and damage output, this makes it a staple for following up combos and spacing. However, its knockback has been noticeably weakened from Smash 4, rendering it unable to KO reliably except near edges, and it can no longer autocancel in a short hop, while also being risky to use offstage due to its high ending lag. As a result, Ike's neutral and back aerials are now generally superior options because of their lower lag, neutral aerial's better combo potential, and back aerial's higher damage and better power, with forward aerial's only advantages over them being its longer active frames and vertical range. Repositioning Slash 14% Quickly turns around to perform an outward slash. Due to it hitting on frame 7, it is Ike's fastest aerial. When coupled with its high damage and knockback for its speed, long horizontal range, low landing lag and ability to autocancel in a short hop, it is one of Ike's most viable approach and KO options. It can KO middleweights at around 120% from the center of Final Destination. Like the rest of Ike's aerials, however, its high ending lag prevents it from being used offstage as safely. It also has short vertical range. Rising Swing 11% An overhead arcing slash starting from the front. It has large coverage around Ike, low landing lag (the second lowest out of his aerials) and high knockback, allowing it to function as a highly effective juggling move. It can also set up combos into an up tilt or any of Ike's aerials (including itself) when SHFF'd, and is able to KO opponents reliably near the upper blast line at high percents. Its disadvantages are its slow startup and high ending lag, making it difficult to land from a neutral state; however, due to its efficiency in punishing opponents and racking up damage elsewhere, it is one of Ike's most useful moves. 15% A two-handed downward slash between his legs. The tip of Ragnell is a meteor smash, while the blade launches opponents at a horizontal angle. It is Ike's most damaging aerial and has high knockback, KOing opponents at around 125% from the center of Final Destination with its non-meteor hitboxes. The meteor smash hitbox also enables it to start combos against grounded opponents for high damage, leading into nearly any of Ike's attacks depending on the opponent's percent, and even possessing a KO setup into an up aerial at high percents. However, it has the slowest startup and shortest hitbox duration out of Ike's aerials, as well as poor horizontal range. 1.6% A headbutt. Moderately slow, but one of the most damaging pummels in the game. 3.5% (hit 1), 4% (throw) A front kick. It is a semi-spike, which makes it a reliable edgeguard setup at high percents. However, due to its high ending lag, it is unreliable for tech-chasing. 3% (hit 1), 4% (throw) A spinning back kick. It is a semi-spike like forward throw, which also makes it a reliable edgeguard setup at high percents, but has less ending lag by comparison that grants it tech-chasing potential, most notably into dash attack at low to medium percents. 3.5% (hit 1), 4% (throw) Plunges Ragnell into the ground and then double axe handles the opponent upward. It is tied with forward throw for Ike's most damaging throw by a slight margin. It has overall weak knockback and moderate ending lag, allowing it to combo into a forward or up aerial from mid to high percents for slightly more damage compared to using down throw; however, these followups are not as reliable due to the throw's higher ending lag, while it also lacks any notable KO potential by itself. 3% (hit 1), 4% (throw) A one-handed body slam followed by a knee drop. Its average base knockback, relatively low ending lag and vertical angle make it an excellent combo starter from low to mid percents, particularly into an up tilt (against larger characters), any of Ike's aerials (except down aerial), and Aether. Due to its surprisingly high knockback scaling, it is also Ike's strongest throw, KOing middleweights at around 190% without rage. As a result of this, however, its followups stop working earlier compared to up throw. 7% Swings Ragnell around himself. 5% Swings Ragnell around himself. Eruption 10% (uncharged), 35%/28%/26% (fully charged, first pillar), 31%/25% (second pillar), 27%/22% (third pillar) Lifts Ragnell in front of himself in a two-handed reverse grip, and plunges it into the ground to produce a pillar of blue flames. It has transcendent priority and is chargeable, causing Ragnell to become engulfed in flames that become more prominent the longer it is charged. Its impressive vertical range and respectable power even when uncharged make it useful for edgeguarding, hitting recovering opponents before they can grab the edge if timed properly. When reaching full charge level, it grants super armor and produces one additional flame pillar away from Ike, or two if held for the maximum duration, significantly increasing its horizontal range; however, it also deals 10% recoil damage in the process. It can KO middleweights at around 150% when uncharged, and at around 55% from center stage when fully charged. The flame pillars at full charge deal more damage the closer to their base opponents are hit. Quick Draw 6% (uncharged), 13% (fully charged) Kneels on one knee and readies himself to charge forward. If an opponent comes in range, Ike will perform a lunging outward slash. When fully charged, the slash is strong enough to KO middleweights at around 120%. However, it has high ending lag if no opponent comes in range. In midair, it renders Ike helpless if he does not hit an opponent, but can still function reliably as an alternate recovery option due to the long horizontal distance it provides when charged, as well as its very low landing lag if timed properly. Aether 6% (hit 1 clean), 4% (hit 1 late), 2% (hit 2), 1% (hits 3-5), 3% (descent), 6% (landing) Performs the Sol portion of Aether. It covers a respectable amount of vertical distance, but almost no horizontal distance. It grants super armor when initiated and until Ike begins rising, which is longer if the move is used on the ground, while all but its first hit have transcendent priority. Although it is primarily used for recovering, it can also function as a useful damage racking option when all of its hits connect due to its high total damage. The start of its descending hitbox also meteor smashes opponents, allowing it to be used for a sacrificial KO. As of the 2.0.0 update, Ike's chance of dying before the opponent during the move has been increased, making the tactic less reliable. Counter 1.2× (minimum 10%) Parries and then counterattacks against any incoming attacks with a reverse gripped downward slash. It is slow for a counterattack, activating on frame 9, and has high ending lag, but is among the strongest counterattacks in the game. Additionally, due to granting Ike full intangibility on frames 8-15, it can effectively be used to retaliate against attacks one frame before its counter window. Great Aether 5% (hit 1), 3% (hit 2), 2% (hits 3-15), 5% (hit 16), 4% (hit 17), 10% (hit 18) Performs an upward slash while Ragnell's blade is engulfed in flames. If any opponents are hit, they are launched upward and Ike throws Ragnell into the air along with them. He then leaps upward, catches Ragnell while its blade is still aflame, and unleashes a devastating series of slashes alongside a thrust, a wheel kick and a roundhouse kick. Ike then concludes the attack with a descending, two-handed slash that slams the opponent to the ground and creates a massive explosion upon impact. The explosion launches the opponent and any bystanders toward the upper blast line. Warps onto the stage using warp magic and grunts while briefly performing an inward slash. Up taunt: Holds Ragnell with both hands in front of himself while growling loudly as wind blows through his cape. Down taunt: Plunges Ragnell into the ground, then folds his arms while saying "Hmph!" with a smug facial expression as wind blows through his cape, and removes Ragnell from the ground. Taps Ragnell's blade on his shoulder. Rubs the edge of Ragnell's blade. Slashes his sword twice. Path of Radiance Ike says, "Your skills were… remarkable." (あんたの戦い、見事だった, Your combat was excellent. ), while Radiant Dawn Ike says, "Don't stand in my way." (どうして俺の前に立った, Why do you stand before me?). Forcefully plants his sword into the ground, then crosses his arms. Path of Radiance Ike says, "I submit to no one." (誰にも、譲る気はない, I cannot yield to anyone. ), while Radiant Dawn Ike says, "I must move forward." (俺は前に進む, I move forward.). Performs Aether while facing the screen. Path of Radiance Ike says, "You'll get no sympathy from me." (極めれば…誰にも負けはしない, To the end… I will not lose to anyone. ), while Radiant Dawn Ike says, "I fight for my friends." (俺には守るべき物が在る, I have things I must protect.). Marss - Co-mains Ike alongside Zero Suit Samus. Placed 9th at Let's Make Moves and 25th at GENESIS 6. Miloni - Placed 5th at Holiday Heist 4: Ultimate Edition. MkLeo - The best Ike player in the world. Placed 1st at GENESIS 6 (Using him alongside Lucina), Smash Conference United and 2nd at Frostbite 2019. Ravenking - Placed 13th at Midwest Mayhem Ultimate and has a win over tyroy. Ryuga - One of the best Ike players in the United States. Placed 1st at Holiday Heist 4: Ultimate Edition, 9th at Frostbite 2019 and 33rd at Glitch 6. Toronto Joe - Placed 17th at Don't Park on the Grass 2018 with Ike as one of his characters. Zackray - Placed 1st at Umebura SP 2. Has a win over Eim. Ike's opponents are all fighters in black alternate costumes, referencing his rivalry with the Black Knight. Although Ike does not appear in the World of Light opening cutscene, he was vaporized and later imprisoned alongside the rest of the fighters (sans Kirby) when Galeem unleashed his beams of light. Ike was one of the many fighters that fell under Dharkon's control upon Galeem's first defeat. He is one of the fighters found in the Mysterious Dimension sub-area, being an obligatory unlock before the next necessary fighter battle Meta Knight is encountered. Ike's default Fighter Spirit can be obtained by completing Classic Mode, or by completing a challenge. Both his default and alternate Fighter Spirits are also available periodically for purchase in the shop for 500 coins. Unlocking Ike in World of Light allows the player to preview the first spirit below in the Spirit List under the name "???". As Fighter Spirits, they cannot be used in Spirit Battles and are purely aesthetic. Each Fighter Spirit has an alternate version that replaces them with their artwork in Ultimate. Ike performing his neutral aerial on Skyworld. Launching Meta Knight on Coliseum. Throwing Ryu on Boxing Ring. Charging Eruption on Prism Tower. Hero Ike performing his neutral aerial on Coliseum. Evading Bowser's Bowser Bomb with Ness on Gaur Plain. With Duck Hunt on Spirit Tracks. Hero Ike taunting with the Squid Sisters on Town and City. Ike is the only character who uses different voice clips in alternate costumes while still being the same person, as opposed to gender-swapping (Robin, Corrin, etc.) or becoming a completely different character (Bowser Jr.). Bayonetta also uses different voice clips in her alternate costumes, though this only applies to the Japanese version of the game. Ike, Inkling and Pokémon Trainer are the only characters to have alternate costumes with different animations. Ike's Radiant Dawn alternate costume has a different defeated/No Contest animation. In the segment in which Ike uses Great Aether from his character showcase video, there is an error in which his portrait displays him in his Fire Emblem: Radiant Dawn outfit despite currently being in his Fire Emblem: Path of Radiance outfit. 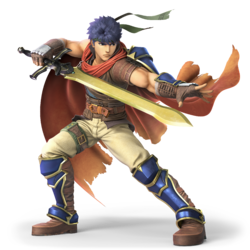 Ike's pose in his official artwork resembles the Mii Swordfighter's artwork from Super Smash Bros. 4 and his sidestep in the same game. Several of Ike's new Japanese victory quotes are taken directly from his original games. In his Path of Radiance costume, he can say "極めれば…誰にも負けはしない" (To the end... I will not lose to anyone. ), which originally appeared during Ike's battle with the Black Knight in Chapter 27 of Path of Radiance. The line was originally translated as "My sword-fighting skills were given to me by my father. If I stay true to them, I cannot lose." Ultimate uses the pre-existing line, "You'll get no sympathy from me." In his Radiant Dawn costume, he can say "どうして俺の前に立った" (Why do you stand before me? ), which originally appeared when Micaiah confronted Ike in Chapter 3-13 of Radiant Dawn. The line was originally translated as "Why would you seek me out?" Ultimate translates it to "Don't stand in my way." In his Radiant Dawn costume, he can also say "俺には守るべき物が在る" (I have things I must protect. ), which originally appeared before Ike's battle with the goddess Ashera in the the final chapter of Radiant Dawn, Rebirth 5. The line was originally translated as "This battle means more than any of the others, because it’s for the life of every person that I’ve ever cared about." Ultimate uses the pre-existing line, "I fight for my friends." Ike's amiibo selects his Radiant Dawn alternate costume, which was the basis for the figure and his SSB4 design, by default. This page was last edited on April 18, 2019, at 19:02.